Maybe you've done some backpacking in the Rockies or car camping in California or the Carolinas. You have a good understanding of what to take camping but need a little help with getting ready for your first kayak camping trip in Florida. That's where Green Wave Forum is here to help! In addition to basic paddling gear - boat, paddle, PFD, spray skirt - your kayak trip will require loading the boat with camping gear, additional clothing, food and cook kits, toiletries, tents and a long list of sundry items. See this link for a good camping gear checklist. When camping from kayaks, you face many of the same challenges as backpacking - what you pack and how you load is important. A backpack loaded incorrectly will put additional strain on your bones and body, while a kayak loaded incorrectly will cause it to lean, become unstable or weathercock (turn into the wind). When you backpack, weight is the single most important issue. Most backpackers scrimp on necessities, eliminate luxuries and carry only the lightest of gear. From my Colorado days, I know a few who even went as far as cutting off the handle of their toothbrush to save that extra 1/2 ounce. The good news is that with kayak camping you can have a full-length toothbrush. You can even bring toothpaste since weight is not the most important issue. What is? Safety. You need to understand how to safely pack all of that camping gear and goodies in your boat. The last thing you want to do is pack big bulky items between your legs in a closed cockpit kayak, making it a potential casket if you flip over and can't wet exit or perform an Eskimo roll. You also don't want to strap lawn chairs, coolers and other bulky items to the deck of the kayak, again, making it unstable and looking like a floating garage sale. We'll take a look at this in more detail in the "How to Load your Kayak" section of this page. As with any watersport, things get wet and kayak camping is no exception. Waterproof hatches leak - have you checked your boat after an extended trip in rough water? If there are a few drops of water in the storage areas in an empty boat, you can be sure there will be quarts of water in there once the boat is fully loaded. Some items need to stay dry, such as your sleeping bag, toilet paper and matches. To keep these free of moisture, use a dry bag or at least put them in thick plastic trash sack and then put the plastic sack inside of a nylon stuff sack (like the kind you use for backpacking). It will probably take a few attempts at packing your sleeping bag; they do not go easily into most dry bags. For items that need to stay at least semi-dry, such as a camp stove or tent (minus poles), use a nylon stuff sack. When you are at the store, get several bags of each size, particularly the smaller ones since this will allow you to pack smaller items around larger ones in the dry storage areas of your kayak. If you are kayak camping and using a sit-on-top kayak, most have a dry storage in the front - use this for lighter items that need to stay dry. For heavier goods, use one or two large dry bags, such as the Seal Line Baja(tm) 30-liter bags. Pack smaller bags inside of these. When there is a possibility of a portage or a need to carry camping gear a long distance from where you docked, bring an empty 40-liter dry bag or large duffel bag. This will allow you to unload most items from the kayak and carry them to the campsite without having to make umpteen trips. There are some nice tapered bags that fit into the front of a tandem or recreational kayak. I have one that even has a long inflator hose so it functions both as a dry bag and flotation. Find one online and use it. One final note on dry bags. Make sure they fit through the hatches on your kayak. I have had a number of times where people showed up at the put-in with dry bags that could not possibly fit and we had to re-pack before launching. Let's talk quickly about food and water. Be sure to repackage food at home, eliminating glass bottles and heavy and bulky boxes. Use a waterproof maker to label each food bag with contents and when it is to be used - such as "Spaghetti Dinner - Saturday". Here is a link to more food storage and camp cooking tips. You'll need a gallon of freshwater per day, per person. Water is heavy; sloshes around and can make your kayak unstable. I recommend using smaller 1 / 2 and 1 gallon containers, at most a 2.5 gallon collapsible bag and never anything larger. On my first kayak camping trip I brought along a 5-gallon water bag only to have my kayak flip during a relatively easy beach landing. CamelBak, Platypus and Dromedary bags are handy. Look them up on the 'net. Most sea kayaks can carry at least one hundred pounds of gear plus the paddler. Some recreational kayaks can do the same or more but check the specifications for your particular boat before loading. Usually the issue isn't so much weight as it is shape and size. Trying to squeeze a 16-inch in diameter sleeping bag or dry sack through an 8-inch hatch doesn't work too well. Be sure to get bags that will make it through the opening. When loading, heavy items go at the bottom of the boat and close to the cockpit. Your heaviest item, probably water containers, should be placed in the rear of your boat, against the bulkhead. Depending upon the distance from the rear hatch to the rear bulkhead, you may want to load water last. Place lighter items, such as clothing, on top of the water containers. You can keep one or two smaller water bottles behind your seat, on the cockpit side of the bulkhead. Place food and cooking equipment immediately behind the water to keep the weight near the cockpit and centered. Do not put heavy items in either the very tip or very back of your boat. It also goes for loading a bunch of heavy stuff in the front hatch. This will make your kayak unstable. Do not put a bunch of bulky items in the cockpit and between your feet. If you need to place items inside of the cockpit area, use small dry bags and make sure they are placed forward of the foot pegs. Tie a short length of rope or string on the bags for easier retrieval but make sure you can't get tangled up in the rope if you have to wet exit. Do not tie a bunch of stuff on the deck of your kayak. It will make it unstable and more susceptible to wind and wave action. If you need to use your deck for storage, tie one or two small dry bags to the deck lines on the back of your boat. Take the poles out of your tent's stuff sack and pack them separately. This will usually allow you to compress the tent even more, while the long thin poles can be placed just about anywhere in the boat. When packing your kayak, make sure that most of the weight is in the rear of the boat and the weight is distributed evenly from side to side. You don't want 70% of the weight on the left side, as it will cause the boat to constantly turn in that direction. Pack it tight. Make sure that items cannot roll around in either the front or rear dry areas. Allowing them to do so will result in an unstable boat. Now that you've learned to properly pack for a kayak camping trip, why don't you make a dry run of it at home? With the kayak set out in your backyard or garage, collect all of the items on your camping gear checklist, fill your water bags, grab a few foodstuffs from the pantry and start packing! Does it all fit? When you get ready to do this for real, be sure to bring a change of clothes, washrag and towel and a bit of extra money to leave in the car. That way you'll have clean clothes and semi-proper grooming for stopping at your favorite restaurant on the way home. Enjoy your kayak camping trip and be sure to share your experience with us. You are in the public comment zone. What follows is not from Green Wave Forum; it comes from other people and we don't vouch for it. 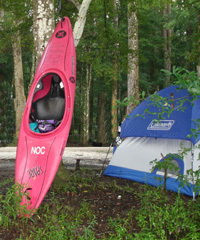 Try an Everglades overnight kayak camping tour. Come kayak, explore and truly experience the REAL Everglades! You can find complete details on all of the trips at www.everglades-kayak.com. Let me know if you have any questions. If you plan to be out on open water a small weather radio for detailed info about wind speed and direction would be handy. A few handy items to have in your first aid kit : Ibuprofin (body/head aches & fever) Benadryl/Hydricortizone or other anti itch cream(bug bites/ poison ivy etc.) Heartburn medication, Anti-diareah pills(hopefully not neede but...) Vitamin C tablets( crush tablet mix in small amount of water and apply to burns to releive sting and reduce blistering. This actually works even on sunburns) Atheletes foot/jock itch cream(wet feet and shorts condusive to such) Hopefully this will help make your trip more comfortable and enjoyable. I put my sleeping bag and a small round throw pillow in a five gallon bucket with a lid. In my sit in kayak this fits neatly in front of my feet. This not only keeps my bag dry but gives me a fairly comfortable seat (turn it upside down so as not to break lid and place small pillow on top) as wellas a bucket to do laundry or dishes in. It also comes in handy for food storage at night and when collecting water for drinking prior to filtering(let water sit in bucket about an hour a lot of debris suspened in water will settle to bottom) That little pillow will also help to make for a much more comfortable nights sleep. One gallon of water per person per day seems lite to me personally, unless you have a way to filter or purify more if needed. Two gallons would be a safer number espescially in hot weather. I would also like to add that I have found that an empty one gallon arizona tea jug makes for a very durable and cheap water jug.